The spring wind is in the air. Consistent days of wind are the norm as well as bad allergies. 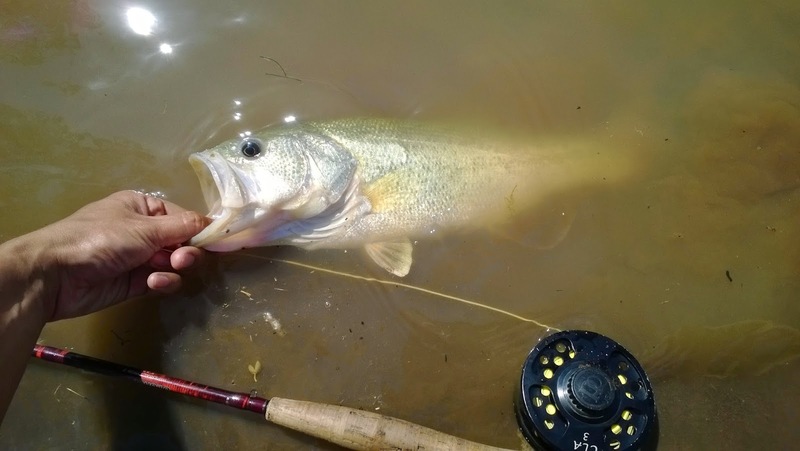 Many anglers believe that we are about a month ahead of season schedule. With early arrival of steelhead, stripers, and shad, the weather is feeling like early summer yet we're only in April! 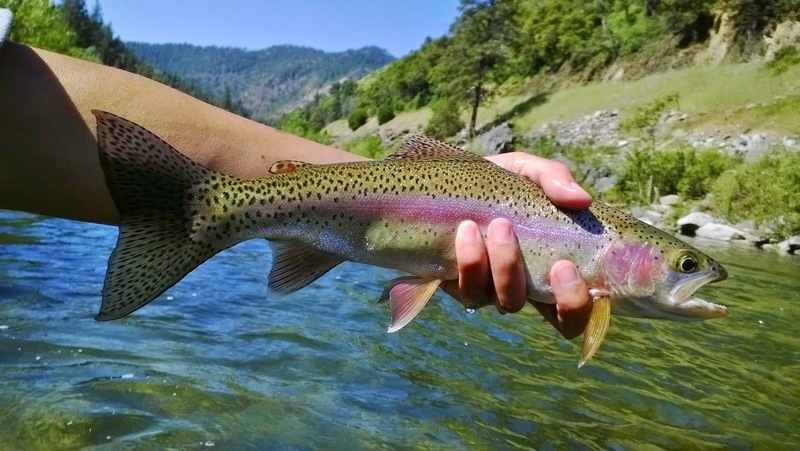 While waiting for trout season to open, I've been fishing at Horseshoe Lake and the North Fork of the Feather River. Despite windy conditions this week of 10-20 MPH gusts, I was able to put a few fish to my name out on the lake. I decided to wet my line after work on Wednesday and after covering some water I had a small catfish and later a fat bass on a fly. There was an odd cold front that just passed Tuesday lowering the air temperature to a chilling 66 degrees so I'm assuming the fish were still in the process of waking up. I went again the following morning and had 3 takes. The first one was very subtle and felt like a snag so I raised my rod instead of setting the hook. 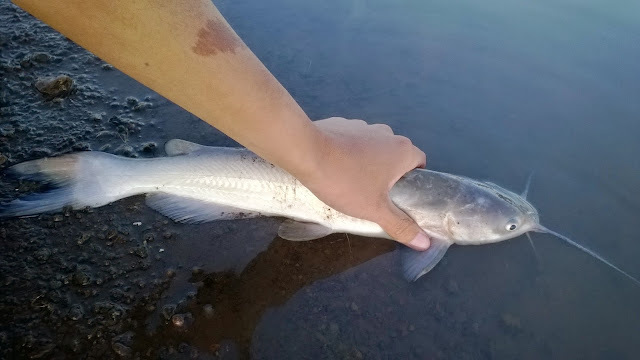 The second take was a catfish that was a good skunk beater. The third take was a lunker bass over 5# that kept jumping to throw the hook. She was probably a little bigger than the biggest one I caught a month prior or possibly the same fish. The lunker bass finally threw the hook after several headshaking jumps. Darn. At least I saw what I lost instead of it never knowing what it was. I'll get her next time. Sometimes the wind in the Feather River canyon can be twice as bad as it is in the valley. This Saturday the weather was absolutely perfect. I started in Pulga and made my usual rounds. Fishing one of my more productive holes, I saw a silver flash as I stripped in my flies; my first target of the day. My next cast I adjusted my dead drift and got the take. A nice little fish to start the day. I fished around Pulga a little longer but didn't have any luck. Once I got back to my car, I took some time to scout out some new spots to fish that were legally open. 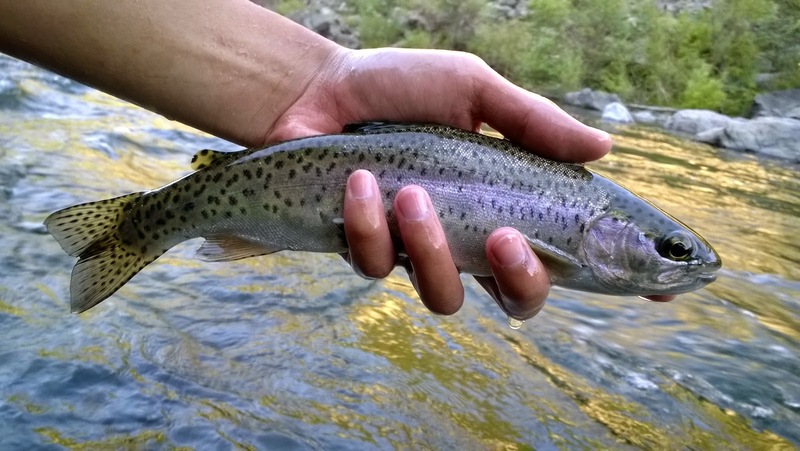 The fish on the North Fork are very particular of where they like to hold. A lot of spots that look like it should hold fish often don't. 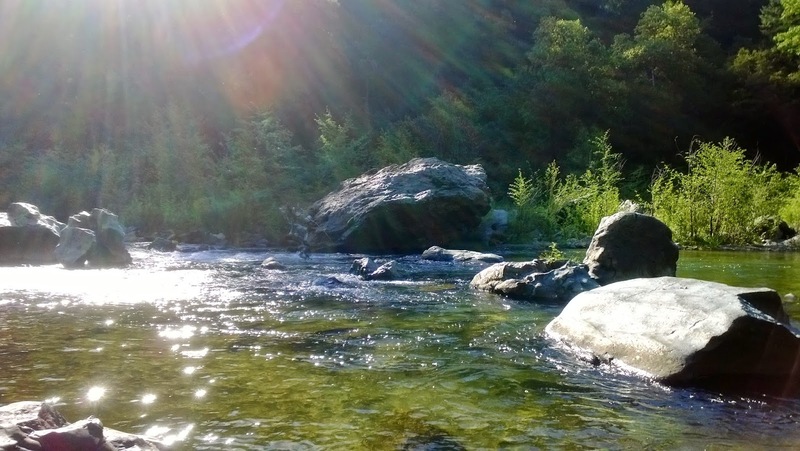 After parking and hiking a bit, I found a nice riffle pool near the dam that looked nice and fishy. My first cast here was a dead-drift swing which, to my surprise, enticed a few nibbles. I threw two more casts but what ever it was that bit wasn't interested any more. After switching to a caddis pupa, I swung my line across the current then BAM hook set! The fish made my reel scream and also displayed some acrobatics jumping out of the water a few times to try and throw the hook. After a few minutes I landed quite the beauty. Once I landed the fish I thought to myself, "Maybe I can rise a few fish." The next patterns I threw were a caddis and mayfly dry which was able to get a total of 4 fish to rise. Although I didn't land them it was pretty awesome to get some dry action for the day. Lost a nice 16 incher. In the evening I tried fishing the Sac for shad but it looks like they haven't made their way up to Chico yet. They are being caught down river near Verona though. The trout opener next Saturday is looking good. A lot of streams are fishing well early this year. On Sunday I will be exploring the Upper Sacramento River for the first time. After not really feeling up to the drive to the Upper Sac, Amanda and I decided to hit up Paradise Lake. The lake was closed for some reason so we had to drive all the way back down to Chico to go to Upper Bidwell. There were a few kiddos catching catfish on salmon eggs but I didn't get a take until my very last cast. As I was leaving I dragged my flies back to put them away and thought I snagged on something. It wasn't a snag it was a fish! 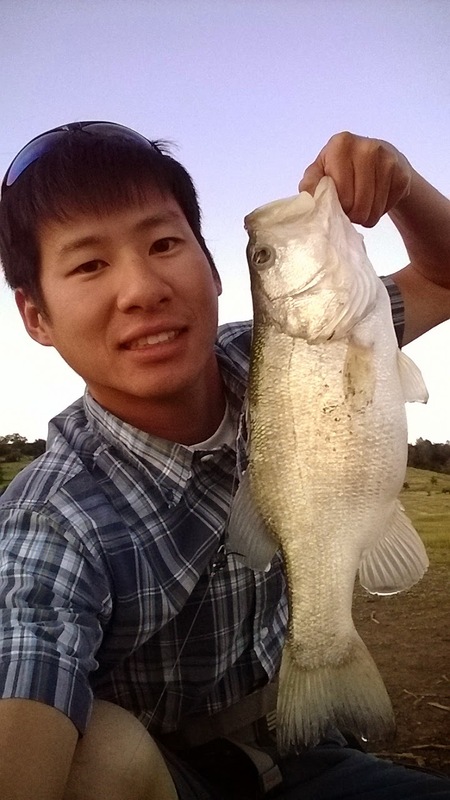 A nice 2# bass that made fishing the 2.5 hours worth it.